My name is (Your Name), S/O (Parents name), the resident of (Address, Area, and City name). I have got married with (Bride name), D/O (Bride’s parent’s name) on (date: DD/MM/YY) at the (Institute name, Court / Mosque / Church etc); you were the (Authority type, e.g., pastor) who has bounded us in God’s name. (Describe in your own words). Pastor because of relocated from the previous location/house, we have lost the marriage certificate during shifting to our new house. (Explain the actual cause and situation). I did not notice but yesterday (date) I went to change the name and address on identity card of my wife, they asked me to bring marriage certificate. They cannot change it without a marriage certificate as proof. (Explain all about the situation). 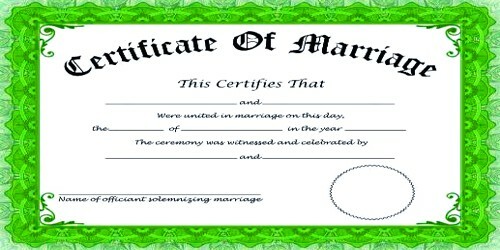 I request you to make a new marriage certificate so we can have it for future process/need. I am writing our names, ages, date of birth, residence address below. (Cordially describe your requirements). Hope to get a quick response from you. Respectfully, it is my humble request that kindly issues my marriage certificate as soon as possible. (Describe in your own words). I got married 2 months ago (More/less) and still did not get my marriage certificate. (Cordially describe your requirements). Hope that soon you will act upon my request.